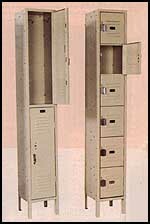 High Quality lockers are designed with premium features at no additional charge. Standard heavy-duty 20 ga. zinc coated locker bottoms provide additional strength and protection from rust. Lockers also feature flat tops, 6" legs, bodies fastened on 9" centers, recessed handles with padlock attachments and much more!